It had been at least a year since I’d last had a chance to taste Hog Islands, California’s premier oyster, so I was quite happy to remedy that this week in a debaucherous tasting of several dozen Hogs and nine, yes, NINE different wines. Hog Island Oyster Farm is a little piece of paradise right on Tomales Bay, north of San Francisco, between Point Reyes National Seashore and the mainland. Picnicking there is one of the great pleasures of the Bay Area. One nice thing about Hog Island is that they raise three different varieties of oysters, so whether you visit them in person or order online, you can play around with a great diversity of flavors. With Totten Inlet Virginicas being unavailable for at least another year, Hog Island is the only source for people who want to taste what an east coast oyster will do in west coast waters. The Hog Island Atlantics have handsome green-gold shells with a hint of pearlescence, and an intensely briny taste, as you’d expect from a bay with nearly oceanic (33 ppt ) salinity. Virginicas grow very slowly on the cold waters of the west coast. These two-year-olds were still a little small for my taste. The larger ones had a depth and fruitiness, kind of like basmati rice, that balanced the salt. (This flavor peaks in summer, when they are at maximum plumpitude.) They were great with an Unoaked Chardonnay from The Crossings, and surprisingly good with The Crossings 2009 Pinot Noir, a beautifully Burgundian Pinot that sells for $20 and drinks like a $40 bottle. The overarching taste profile of all Hog Island oysters is light and clean. (This may be because they purge all their oysters after harvest in a clean, filtered holding tank.) 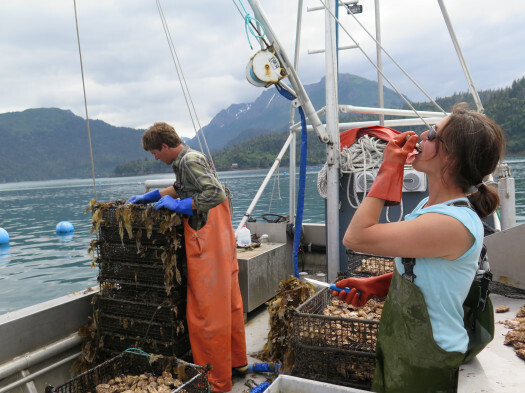 You don’t get any of the strong low-tide flavors that you sometimes find in Puget Sound and lower Hood Canal oysters. The Hog Island Kumamotos were very small and mild, with a greenish-pink tinge to their flesh and a creamy watermelon finish. They were perfectly matched with a Bordeaux rose from Andre Lurton. Usually I prefer Atlantic and Kumamoto oyster to Pacifics, but because Hog Island oysters taste so clean, I like their Hog Island Sweetwaters (which are Pacifics) most of all. They come on salty, then display those great, crisp grassy/lettuce flavors that can be so alluring in Pacific oysters, and they finish nice and sweet. Plus they have those beautiful, ruffled shells with swirls of purple. A living work of art!